Sustainable agriculture is a new and exciting area of research being conducted at The Center for Sustainable Development (CSD). The experimental research is being lead by two of our Biologists, Sarah Richardson, Ecotoxicologist and Sustainability Teacher, and Mark Young, Permaculture and Sustainability Research Teacher. Using local waste resources including coconuts and seaweed, the team is investigating the potential positive effects on the germination, growth and yield of cover crops in sandy soils. Their research will provide critical results that can be used to educate local farmers of Small Island Developing States, such as Eleuthera, as well as to contribute to global research on sustainable alternatives to traditional farming practices. The research began in January 2016 with the construction of CSD’s first biochar kiln. Biochar is the product of pyrolysis, where organic matter is heated to high temperatures in the absence of oxygen to create a substance rich in carbon. Biochar has been proposed as an option to mitigate climate change, with its greatest potential being for sustainable agriculture as it simultaneously sequesters atmospheric carbon dioxide while replenishing the soil with nutrients and increasing crop yields. After many early attempts, the CSD summer intern team constructed the latest pyrolysis kiln, a repurposed 48 gallon water pressure cylinder capable of producing an average of 5kg of coconut husk biochar with each firing. In September 2017, the research team, including The Island School students, designed and constructed CSD’s first experimental research garden. The experiments are currently underway and the team hopes this new project will further contribute to the growing scientific and public interest on sustainable farming practices. CSD is very excited about the newest innovative area of research and hopes to continue expanding on permaculture and sustainable agriculture initiatives. Island School students working to construct the Research Garden in which their research class will be focused. With an eye towards continued improvement of our campuses and facilities, this fall, an Island School Research Team has engaged with The Deep Creek Middle School (DCMS) in a energy audit and sustainable systems retrofit. With DCMS already an EcoSchool, initiatives like this help Principal Mrs. Katie Bauer maintain her school’s distinguished Green Flag Award status. As a United Nations recognized Small Island Developing State (SIDS), The Bahamas faces many challenges, specifically pertaining to fossil-based energy. Due to their isolation, SIDS uniquely are heavily reliant on the import of fossil fuels for electricity generation. The Bahamas consumes over 24,000 barrels/day of refined petroleum products to power the Commonwealth and its 30 inhabited islands. This reliance makes production of electricity extremely expensive due to the high transport cost of fuel imports. The Bahamas relies on fossil fuels to meet a staggering 99% of its energy needs. 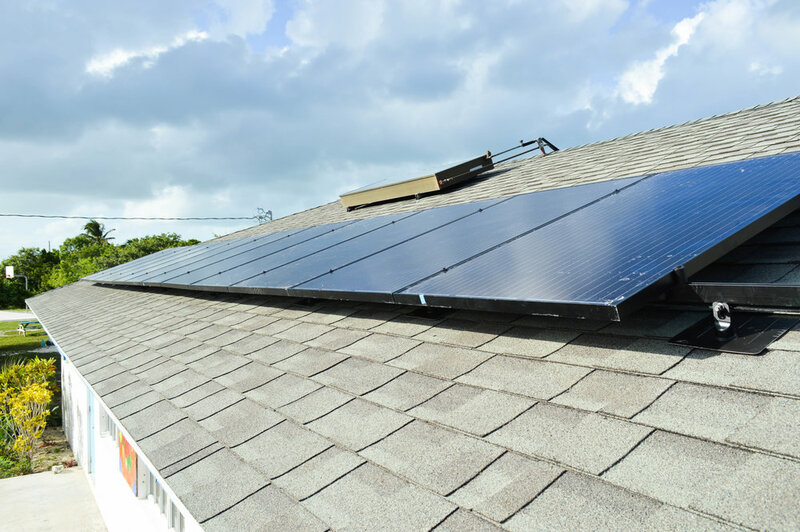 As the demand for energy in SIDS, specifically The Bahamas, increase, it is a necessity that more efficient uses of energy and alternative energy sources be explored. As SIDS struggle to overcome their dependence on fossil fuels for electricity generation, the Center for Sustainable Development intends to demonstrate how the integration of simple renewable energy systems, smart technologies and small measures of conservation can alleviate the effects of reliance on fossil fuels. We hope that the newly installed solar technologies at DCMS will help to decrease their reliance on grid-tied energy. As a new Island School Research Project this fall 2017, with assistance from DCMS students, The Small Island Sustainability Retrofit Project is focused specifically on the energy sector and electricity consumption in the classroom buildings and offices at The Deep Creek Middle School. Island School students have been involved in a number of aspects of this project. Most recently, they helped with the installation of solar (AC/DC coupled) air conditioning systems, and a solar hot water heater for DCMS, which should drastically decrease electricity consumption for the school and demonstrate the application of appropriate technology for the school community. 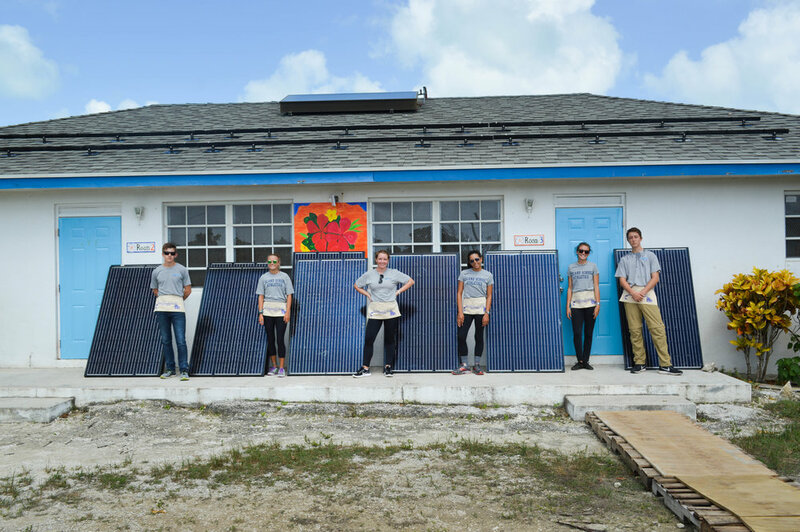 Island School students stand with the solar PV modules before they helped to install them. To test this, Island School students have been working with the DCMS 8th grade math class to measure, monitor and model energy usage in the buildings through data collection and analysis. Further, to apply this work with the needs of the community, students from both IS and DCMS will help in calculating a financial analysis of their hard work to a predict payback period on the solar AC units themselves. The students will be presenting their findings not only during the Research Symposium during Parents’ Weekend, but to the Deep Creek community as well. After the recent addition of a newly established Acropora cervicornis (staghorn coral) nursery, the Cape Eleuthera Institute (CEI) Reef Ecology and Conservation Team has embarked on yet another coral propagation project. 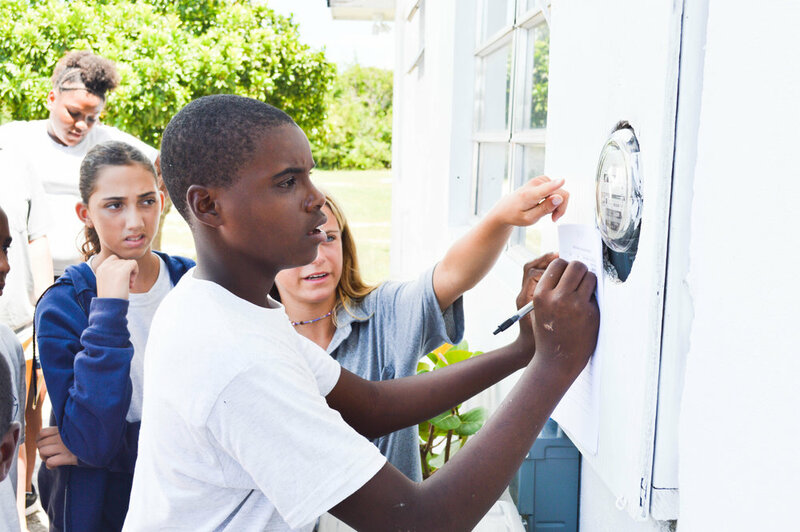 Jodie Ball, Research Technician, is leading the initiative as part of her independent project in conjunction with the Center for Sustainable Development, one of Cape Eleuthera Island School’s affiliate organizations. Their goal is to set up a shallow water coral nursery for the propagation of elkhorn coral (Acropora palmata), also a critically endangered species, that can be used for educational purposes as well as contribute to reef restoration science. There are various acknowledged approaches to coral gardening but CEI has so far only employed one of these innovative techniques, in the form of 2 PVC-trees at both our Tunnel Rock and Bamboo Point dive sites. However, in just a few weeks, Jodie, her team, and members of CSD expanded these efforts, with the creation of two new structures, installed at a shallow water reef just off the south west coast of Cape Eleuthera. This new nursery is cultivating elkhorn coral, which thrives in much shallower water than staghorn coral. Consequently, these new structures were deployed at a shallower depth, between 10-15 feet, and easily accessed from shore. Photo 1: The new nursery structures wait on the deck, ready to be deployed. The two new structures were built using different materials all of which were repurposed materials previously considered to be waste. One of the main goals of our campus is to strive to be a zero waste campus, so the team was quick to jump at the opportunity to repurpose old materials rather than spend a large amount of money on pre-constructed designs. One of the structures is built from rebar and painted with blue anti-corrosive paint (Photo 2), and the other using cinder blocks and cement pucks, with six pucks attached to each of the cinder blocks using a devised cement and bolt method, shown below in Photo 3. After the structures were deployed and secured in their new home, the next phase of the project was to collect wild coral fragments to be grown in the nursery. On the Atlantic side of Eleuthera, scattered colonies of live elkhorn coral can be found in the mostly dead fringing reef that once thrived with many species of coral and sea fans. The team collected a small branch of elkhorn coral from a wild colony which was then broken down into 28 pieces. Once added to the nursery, the new corals were photographed and measured and added to CEI’s compilation of coral data. Photo 2: Elkhorn coral fragments hang from the rebar structure at the new shallow water nursery site. Photo 3: Elkhorn coral fragments attached to cement pucks using epoxy. The team hopes that the new project will provide an opportunity for the many visitors to the Cape Eleuthera Island School to learn about the global decline of coral reefs and how we can aid in their restoration, using a simple design created from repurposed materials that would otherwise have been considered waste. CSD is very excited about the collaboration with CEI and hopes to continue to partner on projects in joint efforts in marine conservation. The anaerobic digester at the Center for Sustainable Development (CSD) was completed in 2012 in a continuing effort towards environmental stewardship and waste management. The two-stage anaerobic digester converts human waste into energy and fertilizer. Furthermore, it provides a safe, natural means for wastewater treatment on campus. Wastewater treatment is a big concern for CSD; the conventional methods of handling sanitary waste in The Bahamas are either spreading it in a field, using chemicals, or deep well injections. Our anaerobic digester gives us a safe, environmentally responsible way to manage our septic waste stream. Anaerobic digestion is a biological process in which naturally present microorganisms break down organic matter in the absence of oxygen. The end products of this system are a renewable energy source, biogas, and a nutrient-rich, organic fertilizer. The anaerobic digester at CSD can process 500 gallons of human waste per week. Other organic waste products such as glycerol, a waste product from processing biodiesel, are also used in the digester. Glycerol has an exceptionally high biogas yield potential, and compliments human waste as a feedstock. After being offline for a time during which an additional pre-pasteurization stage for the system was installed, the anaerobic digester is back online and repurposing waste products into higher-value resources! CSD looks to the anaerobic digester as another component of our larger Waste-to-Energy initiative, in which many systems will utilize products and by-products of multiple processes. Future research on anaerobic digestion will be in the areas of increasing biogas production, minimizing hydraulic retention times, and finding the most effective means of utilizing this energy source. The Center for Sustainable Development is excited to be conducting multiple research projects with the Island School students this semester. Along with Plastic Pyrolysis and Permaculture, a group of six students are carrying out some cutting edge research for our aquaponics system. Aquaponics is essentially the combination of aquaculture and hydroponics, where the nutrients dissolved in fish waste are put to use to fertilize a variety of plants, including a multitude of vegetables for our campus to enjoy at the dining hall. Our aquaponics system provides our dining hall with a variety of delicious vegetables to enjoy! By investigating the feasibility of making our own fish feed, the students are gaining insight not only into the research world, but also the socioeconomic, political, and environmental impacts of alternative food production. Currently, the Nile Tilapia (Oreochromis niloticus) in our aquaponics system are fed commercially produced aqua-feed which utilizes fishmeal to fulfill the protein requirements of their diet. This fishmeal is unsustainably sourced and produced by the processing of small pelagic fish species like sardines, anchovies, mackerel, and other fish that occupy lower ecological niches in the food chain. Currently, 36% of fishing stocks are allocated to produce fishmeal. The students have shown great interest regarding the contradiction that underlies the aquaculture industry; for a system that was instilled to prevent overfishing of our wild fish populations, how is it sustainable that these fish are provisioned a diet composed of other fish, whose populations are also vulnerable to overfishing? How could these fish that occupy lower trophic levels be better utilized? A black soldier fly rests on a tank overlooking our aquaponics system. The Aquaponics research team hopes to make our own aqua-feed using soybean meal, guinea corn, wheat flour, soybean oil and black soldier fly larvae, a nutrient-packed prepupal fly that has a massive appetite for the food waste from the dining hall. If we are successful, producing our own aqua-feed will negate our need to import commercial aqua-feed. More importantly, our results will justify the use of alternatives to fishmeal for protein requirements in aqua-feed diets. Whether it is shifting the provisioning of fish meal from fish to humans, or demonstrating the possibility of preparing one’s own fish feed to small-scale aquaponics farmers, the greater implications of this research are numerous and highly applicable. Students learning what is involved in the daily maintenance of the aquaponics system, including feeding fish and seeding and harvesting fresh produce for the dining hall. In addition to carrying out their research project, the Island School students have been directly involved in daily aquaponic system maintenance, such as assessing water quality, feeding fish and seeding, planting and harvesting fresh produce for the dining hall. Fruits and vegetables such as lettuce, basil, cilantro, parsley, swiss chard, tomatoes, bok choy, kale and other brassicas are handpicked by the aquaponics research team. Much of the success that the system is currently seeing is owned to the students’ hard work and clear commitment to their research class. The Center for Sustainable Development is excited to welcome 53 new students for the Island School spring 2017 semester program and is even more excited to welcome a group of these students to the CSD Repurposing Waste research team. This semester, we will be working on repurposing waste plastic into synthetic diesel fuel via a process called “pyrolysis.” Pyrolysis is thermal decomposition in a high-temperature and low-oxygen environment. Plastic is made from fossil fuels, so pyrolysis can be used to break down or “crack” plastic into its original petroleum constituents. Last semester, our research group worked to design, build and run tests on a lab scale model of a pyrolysis machine that was constructed out of all repurposed materials. Our efforts were successful in pyrolyzing a variety of different plastic types into oil which then was proven to be a usable diesel fuel alternative when it successfully started a concrete mixer! This semester, we are continuing our pyrolysis research by designing and beginning construction on a second pyrolysis machine. This next iteration will be bigger, allowing us to pyrolyze larger batches of waste plastic at once, ultimately beginning to make a dent in the massive amount of waste plastic on our campus. It will also be a more sophisticated model allowing us to control multiple variables, such as the temperature, to collect more accurate data and run more efficient experiments. This semester’s Island School Repurposing Waste Pyrolysis Research Team will help to construct, run experiments and analyze economic and environmental data about the system. We recently heard from one of our partners who has played an influential role in our pyrolysis research. Robert Clyne from Clean Sea Fuels has spent a number of years working to solve the problem of plastic and oil waste. He has specifically been focusing his efforts on developing countries where there is very limited access to recycling and safe waste disposal methods. Of late, Robert has been working on efforts to turn toxic waste oil into a diesel fuel substitute that he calls ReUse fuel. His organization’s first facility in Ghana has seen much success, and plans are underway to start a second facility in Burkina Faso. This facility will not only give people access to eco-friendly, locally-produced and low cost fuel that cleans up the environment, but also provides the benefit of making jobs for oil collectors, fuel makers and mechanics or fuel resellers. Making ReUse diesel fuel using a car battery in a backyard! Roberts’ current work is the first phase of a long-term goal to bring low-cost, eco-friendly sustainable recycling and mass production technology to grassroots entrepreneurs in developing nations. His system only requires a 12 volt pump, a solar deep discharge battery and a filtration system, making it completely mobile! If you would like to learn more about Robert Clyne and his work turning waste into fuel, you can find more information and donate to his efforts here.